Main Switch – this allows you to turn off the electricity supply to your home. It’s important that you know where this switch is so that you can switch off the electricity in an emergency. Some properties have more than one mains switch if there is more than one fuse board e.g. if you have electric storage heaters running off Economy 7 you will have a separate fuse board for this. 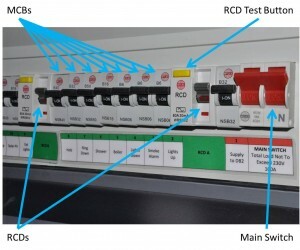 Residual Current Devices (RCD) these switches disconnect a circuit from the electricity supply instantly when a dangerous fault is detected. It is advisable to test your RCDs every three months by simply pressing the ‘Test’ or ‘T’ button. 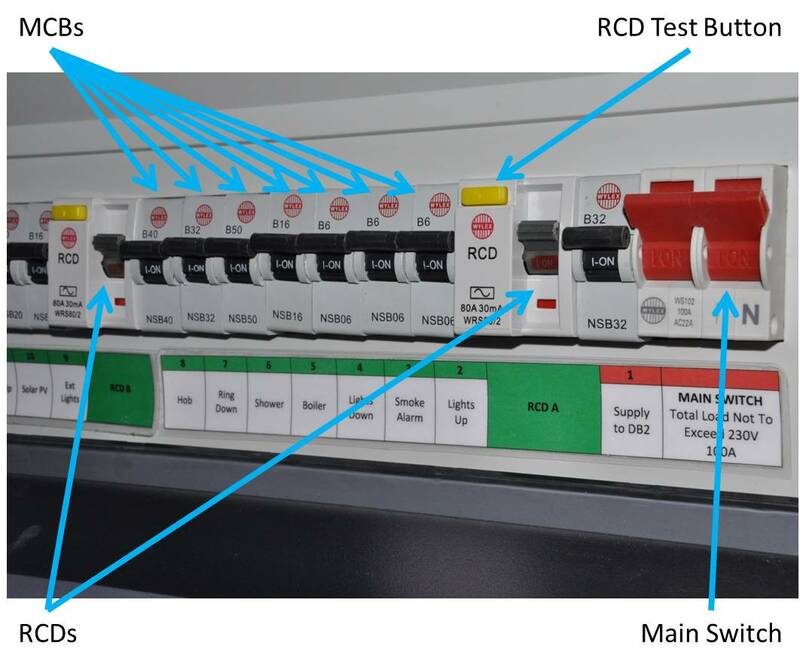 This simulates a fault and ‘trips’ the switch showing you that the RCD is working correctly. You can then reset by switching the RCD back to the on position. If pressing the button does not trip the switch, the RCD is not working so please call us on 01525 213103 and we’ll send an electrician out to check it and replace it if necessary. MCB’s (Circuit Breakers) – these are automatic protection devices in the fuse board that switch off a circuit if they detect a fault. They are similar to a fuse and are sized according to the type of circuit and load it is going to take. So for example, a lighting circuit will be 6 Amps whereas a cooker circuit could be 32 Amps. Some older fuse boards have re-wireable fuses instead of circuit breakers. These have a piece of special fuse wire running between two screws. When a fault or overload current flows through the fuse wire, it will become hot and melt. The melted fuse breaks the circuit, disconnecting the faulty circuit and keeping you safe. If your fuse board has a wooden back, cast iron switches, or a mixture of fuses it is likely that it dates back to before the 1960s and will need to be replaced.